For a shorter list of the latest processors by Intel, see List of Intel microprocessors § Latest desktop and mobile processors for consumers. 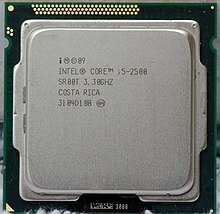 The following is a list of Intel Core i5 brand microprocessors. Introduced in 2009, the Core i5 line of microprocessors are intended to be used by mainstream users. All models support: MMX, SSE, SSE2, SSE3, SSSE3, SSE4.1, SSE4.2, Enhanced Intel SpeedStep Technology (EIST), Intel 64, XD bit (an NX bit implementation), Intel VT-x, Turbo Boost, Smart Cache. FSB has been replaced with DMI. All models support: MMX, SSE, SSE2, SSE3, SSSE3, SSE4.1, SSE4.2, Enhanced Intel SpeedStep Technology (EIST), Intel 64, XD bit (an NX bit implementation), TXT, Intel VT-x, Intel VT-d, Hyper-threading, Turbo Boost, AES-NI, Smart Cache. Core i5-655K, Core i5-661 does not support Intel TXT and Intel VT-d. Core i5-655K features an unlocked multiplier. Contains 45 nm "Ironlake" GPU. All models support: MMX, SSE, SSE2, SSE3, SSSE3, SSE4.1, SSE4.2, AVX, Enhanced Intel SpeedStep Technology (EIST), Intel 64, XD bit (an NX bit implementation), TXT, Intel VT-x, Intel VT-d, Hyper-threading, Turbo Boost, AES-NI, Smart Cache, Intel Insider, vPro. All models support: MMX, SSE, SSE2, SSE3, SSSE3, SSE4.1, SSE4.2, AVX, Enhanced Intel SpeedStep Technology (EIST), Intel 64, XD bit (an NX bit implementation), Intel VT-x, Turbo Boost, AES-NI, Smart Cache and Intel Insider. Core i5-2400 and Core i5-2500 support TXT, Intel VT-d and vPro. All models support dual-channel DDR3-1333 RAM. S processors feature lower-than-normal TDP (65W on 4-core models). T processors feature an even lower TDP (45W on 4-core models or 35W on 2-core models). K processors are unlockable and designed for overclocking. Other processors will have limited overclocking due to chipset limitations. P processors disable the integrated graphics processor. All models support: MMX, SSE, SSE2, SSE3, SSSE3, SSE4.1, SSE4.2, AVX, Enhanced Intel SpeedStep Technology (EIST), Intel 64, XD bit (an NX bit implementation), Intel VT-x, Intel VT-d, Hyper-threading, Turbo Boost, AES-NI, Smart Cache, Intel Insider. All models support: MMX, SSE, SSE2, SSE3, SSSE3, SSE4.1, SSE4.2, AVX, Enhanced Intel SpeedStep Technology (EIST), Intel 64, XD bit (an NX bit implementation), Intel VT-x, Turbo Boost, AES-NI, Smart Cache, Intel Insider, vPro. S processors feature lower-than-normal TDP (65 W on 4-core models). T processors feature an even lower TDP (45 W on 4-core models). i5-3470, i5-3470S, i5-3475S, i5-3550, i5-3550S, i5 3570 and i5-3570T support Intel TXT, Intel VT-d and vPro. i5-3330, i5-3330S, and i5-3350P support Intel VT-d.
Non-K processors have limited turbo overclocking (extra 4 turbo bins). All models support: MMX, SSE, SSE2, SSE3, SSSE3, SSE4.1, SSE4.2, AVX, AVX2, FMA3, Enhanced Intel SpeedStep Technology (EIST), Intel 64, XD bit (an NX bit implementation), Intel VT-x, Intel VT-d, Hyper-threading, Turbo Boost, AES-NI, Smart Cache, Intel Insider, vPro. All models support: MMX, SSE, SSE2, SSE3, SSSE3, SSE4.1, SSE4.2, AVX, AVX2, FMA3, Enhanced Intel SpeedStep Technology (EIST), Intel 64, XD bit (an NX bit implementation), Intel VT-x, Turbo Boost, AES-NI, Smart Cache, Intel Insider. Intel Core i5-4430, Core i5-4430S, Core i5-4440, Core i5-4460, Core i5-4570, Core i5-4570S, Core i5-4670, Core i5-4670S, Core i5-4670T, Core i5-4690, Core i5-4690S, Core i5-4690K support Intel VT-d.
Intel Core i5-4570, Core i5-4570S, Core i5-4670, Core i5-4670S, Core i5-4670T, Core i5-4590, Core i5-4690 support vPro, Intel TSX, TXT. Intel Core i5-4690K supports Intel TSX unlike its older counterpart, the i5-4670K. All models support: MMX, SSE, SSE2, SSE3, SSSE3, SSE4.1, SSE4.2, AVX, AVX2, FMA3, Enhanced Intel SpeedStep Technology (EIST), Intel 64, XD bit (an NX bit implementation), Intel VT-x, Intel VT-d, Turbo Boost, AES-NI, Smart Cache, Intel Insider. Embedded models also support Intel vPro, Intel TXT. All models support: MMX, SSE, SSE2, SSE3, SSSE3, SSE4.1, SSE4.2, AVX, AVX2, FMA3, Enhanced Intel SpeedStep Technology (EIST), Intel 64, XD bit (an NX bit implementation), Intel VT-x, Intel VT-d, Turbo Boost, AES-NI, Smart Cache, Intel Insider, Intel TXT, Intel SGX, Intel MPX. All models support: MMX, SSE, SSE2, SSE3, SSSE3, SSE4.1, SSE4.2, AVX, AVX2, FMA3, SGX, MPX, Enhanced Intel SpeedStep Technology (EIST), Intel 64, XD bit (an NX bit implementation), Intel VT-x, Intel VT-d, Turbo Boost, AES-NI, Intel TSX-NI, Smart Cache. i5-7500 and up (except K models) also support Intel vPro, Intel TXT. Low power models also support configurable TDP (cTDP) down. Embedded models also support ECC memory, but do not support Intel TSX-NI. All models support: MMX, SSE, SSE2, SSE3, SSSE3, SSE4.1, SSE4.2, AVX, AVX2, FMA3, SGX, MPX, Enhanced Intel SpeedStep Technology (EIST), Intel 64, XD bit (an NX bit implementation), Intel VT-x, Intel VT-d, Turbo Boost, AES-NI, Smart Cache. i5-8500 or above also supports: Intel TSX-NI, Intel vPro, Intel TXT. All models support: MMX, SSE, SSE2, SSE3, SSSE3, SSE4.1, SSE4.2, Enhanced Intel SpeedStep Technology (EIST), Intel 64, XD bit (an NX bit implementation), Intel VT-x, Hyper-threading, Turbo Boost, Smart Cache. Core i5-520E has support for ECC memory and PCI express port bifurcation. All models support: MMX, SSE, SSE2, SSE3, SSSE3, SSE4.1, SSE4.2, AVX, Enhanced Intel SpeedStep Technology (EIST), Intel 64, XD bit (an NX bit implementation), Intel VT-x, Hyper-threading, Turbo Boost, AES-NI, Smart Cache. All models except Core i5-24xxM support TXT and Intel VT-d. Core i5-2430M/i5-2435M and i5-2410M/i5-2415M can support AES-NI with laptop OEM-supplied BIOS processor configuration update. Core i5-2515E has support for ECC memory. All models support: MMX, SSE, SSE2, SSE3, SSSE3, SSE4.1, SSE4.2, AVX, Enhanced Intel SpeedStep Technology (EIST), Intel 64, XD bit (an NX bit implementation), Intel VT-x, Intel VT-d, Hyper-threading, Turbo Boost, AES-NI, Smart Cache. i5-3320M, i5-3340M, i5-3360M, i5-3380M, i5-3427U, i5-3437U, i5-3439Y, and i5-3610ME support TXT and vPro. All models support: MMX, SSE, SSE2, SSE3, SSSE3, SSE4.1, SSE4.2, AVX, AVX2, FMA3, Enhanced Intel SpeedStep Technology (EIST), Intel 64, XD bit (an NX bit implementation), Intel VT-x, Hyper-threading, Turbo Boost, AES-NI, Intel TSX-NI, Smart Cache. All models support: MMX, SSE, SSE2, SSE3, SSSE3, SSE4.1, SSE4.2, AVX, AVX2, FMA3, Enhanced Intel SpeedStep Technology (EIST), Intel 64, XD bit (an NX bit implementation), Intel VT-x, Hyper-threading, Turbo Boost, AES-NI, Smart Cache. All models support: MMX, SSE, SSE2, SSE3, SSSE3, SSE4.1, SSE4.2, AVX, AVX2, FMA3, Enhanced Intel SpeedStep Technology (EIST), Intel 64, XD bit (an NX bit implementation), Intel VT-x, Intel VT-d, Turbo Boost, AES-NI, Smart Cache, Intel TSX-NI. Non-embedded models also support configurable TDP (cTDP) down. Core i5-6440HQ also supports Intel TXT. Core i5-6440EQ supports ECC memory. Core i5-6300U and higher also support Intel vPro, Intel TXT, and Intel TSX-NI. All models support: MMX, SSE, SSE2, SSE3, SSSE3, SSE4.1, SSE4.2, AVX, AVX2, FMA3, SGX, MPX, Enhanced Intel SpeedStep Technology (EIST), Intel 64, XD bit (an NX bit implementation), Intel VT-x, Intel VT-d, AES-NI, Intel TSX-NI, Smart Cache, configurable TDP (cTDP) down. i5-7400 and up also support Intel vPro, Intel TXT. All models support: MMX, SSE, SSE2, SSE3, SSSE3, SSE4.1, SSE4.2, AVX, AVX2, FMA3, SGX, MPX, Enhanced Intel SpeedStep Technology (EIST), Intel 64, XD bit (an NX bit implementation), Intel VT-x, Intel VT-d, Turbo Boost, Hyper-threading, AES-NI, Smart Cache, and configurable TDP (cTDP). Low power models i5-7300U and i5-7360U also support Intel vPro, Intel TXT. All models support: MMX, SSE, SSE2, SSE3, SSSE3, SSE4.1, SSE4.2, AVX, AVX2, FMA3, SGX, MPX, Enhanced Intel SpeedStep Technology (EIST), Intel 64, XD bit (an NX bit implementation), Intel VT-x, Intel VT-d, Turbo Boost, Hyper-threading, AES-NI, Smart Cache, Intel TSX-NI, and configurable TDP (cTDP). i5-7Y57 also supports Intel vPro, Intel TXT. ^ a b c Turbo describes the available frequency bins (+133 MHz for processors based on Nehalem microarchitecture) of Intel Turbo Boost Technology that are available for 4, 3, 2, 1 active cores respectively (depending on the number of CPU cores, included in the processor). ^ a b c d e f g h i j k l Turbo describes the available frequency bins (+100 MHz for processors based on Sandy Bridge, Ivy Bridge and Haswell microarchitectures) of Intel Turbo Boost Technology that are available for 4, 3, 2, 1 active cores respectively (depending on the number of CPU cores, included in the processor). ^ "ARK - Compare Intel® Products". Intel® ARK (Product Specs). ^ Anand Lal Shimpi. "The Rest of the Ivy Bridge Die Sizes". ^ a b c "Specifications of Haswell Refresh CPUs". ^ a b c d e "Some details of "Haswell Refresh" desktop CPUs". ^ "2nd Generation Intel® Core™ i5 Processors". Intel® ARK (Product Specs). ^ "Intel® Core™ i5-2410M Processor". Intel. Retrieved January 1, 2012. ^ a b Cyril Kowaliski (January 5, 2015). "Intel's Broadwell-U arrives aboard 15W, 28W mobile processors". techreport.com. Retrieved January 12, 2015.